portion is soft wax form. Embedding mini-implant in the middle of upper left 2nd. 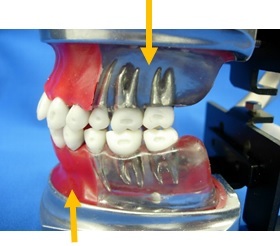 of anteriors with mini-implant anchorage. 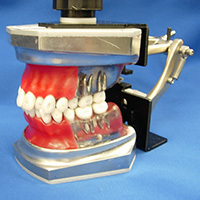 Simple but ample function for any type of orthodontic training. 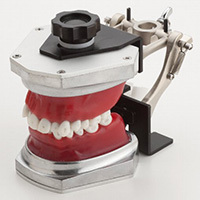 Upper member is easily adjustable for protrusive and lateral movement comes with mountable articulator. 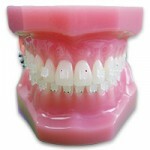 Each type of wax form including ideal arch is available. 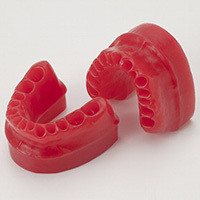 Custom-made wax forms are available by quantity order. 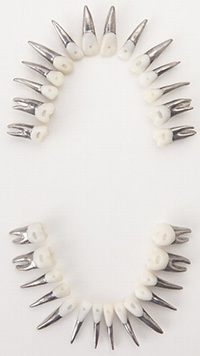 Anatomically rooted metal teeth overlayed with white resin crown. 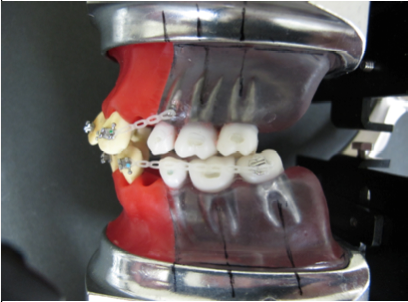 Each buccal surface has concave indentations for better bonding strength of brackets. 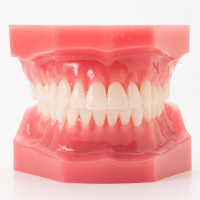 Suitable tool for in-office training or self study of orthodontic technique. Brackets and wires are pre-set. 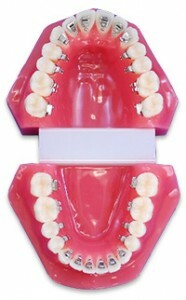 Oral Cavity Cover is an option. 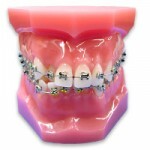 Training for ligation, toothbrushing, dental flossing and oral hygiene study under orthodontic treatments. Any brakets can be applied upon request. 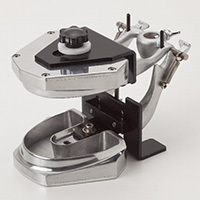 An effective tool for demonstration or patient education. Practical model for practicing of wire bending, ligation technique. We can engrave the logo or initial or any message on the model base if you send us your art work. 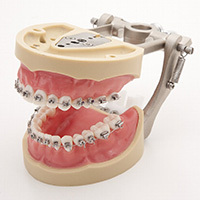 We accept special order by sending us your original orthodontic appliances and advise occlusal condition such as normal or Class I, etc. For further information, please contact us or our representative. Apply each transparent brackets to the teeth surface of ideal arch model. Apply lingual brackets to the model. 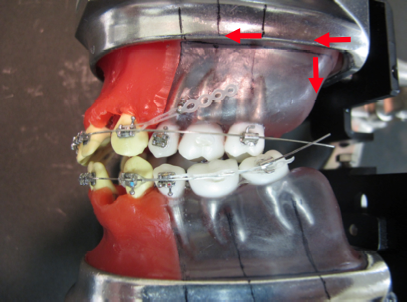 Apply each metal brackets and wires to the surface of malocclusion model.